The Office of State Archaeology will host a series of events throughout the month of October in celebration of North Carolina’s archaeological heritage. Events will include weekly lunchtime lectures on topics such as the archaeology of Cherokee households (Dr. Ben Steere, Western Carolina University), and two evening lectures at the Museum of History on the archaeology of Catawba coalescence (Dr. Steve Davis) and Moravian archaeology as understood through excavations at Old Salem (Dr. Michael Hartley). 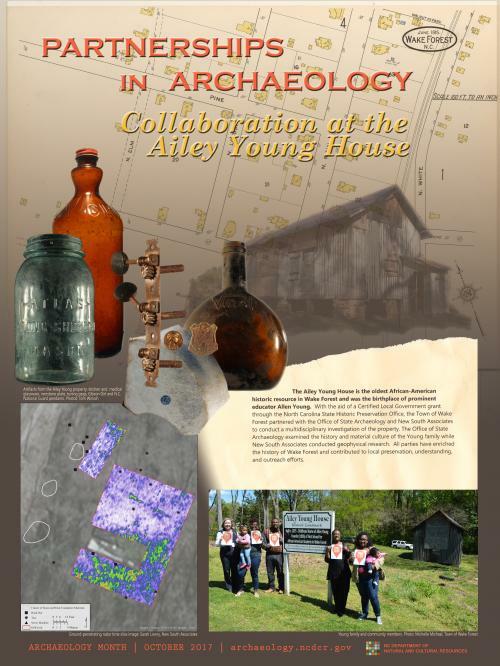 A symposium on October 19th will highlight the great research projects completed by staff, students, and interns through the OSA Research Center this year on collections from Brunswick Town State Historic Site, Halifax State Historic Site, and Charles Towne (31BW133). An updated schedule with lecture titles will be posted as these events are finalized - please check often for updates! Presented by: Dr. R.P. Stephen Davis, Jr. In 1760, following a devastating smallpox epidemic that destroyed more than half the nation, the Catawbas signed a treaty with South Carolina that provided a secure reservation, 15 miles square, in return for relinquishing claim to a much larger tract spread across much of Piedmont North Carolina and South Carolina. Having abandoned their earlier towns in the vicinity of Nation Ford, within a few years the tribe resettled along the Catawba River near the reservation’s southern boundary. This talk discusses the archaeological and documentary record for three of the newly-established settlements – Old Town, Ayers Town, and New Town – that date between the early 1760s and 1820. This was a period during which the Catawbas negotiated rapidly changing social, political, and economic conditions, and the successful strategies they employed are reflected in the archaeological record. Now approaching his 35th year of archaeological study of the Moravians of Wachovia, Dr. Hartley, Director of Archaeology at Old Salem Museums and Gardens, will talk about past, present and future historical archaeology there. Over the last several decades, archaeologists have become increasingly interested in a variety of cultural behaviors along the edges of the Mississippian world. Although most research has focused on the Mississippian side of this boundary, there is obvious utility in understanding the societies on the other side, particularly where interaction across the cultural frontier may have occurred. This research seeks to understand the economic behavior among one of these societies, the Piedmont Village Tradition (PVT) in the upper Yadkin River Valley (UYRV). It compares the relative counts and weights of local and non-local materials between fifteen sites and analyzed the reduction characteristics of flake assemblages at three sites. The goal is to understand how these different lithic materials were being used and what their patterning tells us about PVT exchange patterns, or lack thereof. The results suggest that UYRV communities did not have equal access to rhyolite sources, which were used by PVT groups across the Piedmont. Two later sites, previously reported by Ned Woodall, had higher concentrations of Appalachian chert, suggesting interactions shifted toward Mississippian neighbors over time. Research like this can help us address several broader topics, such as the size and structure of Pre-Columbian trade networks and the economic relationships between hierarchical and egalitarian neighbors.